(0 Customer Reviews) | Write Review 12 issues per year San Diego Magazine gives readers the insider information they need to experience the best of San Diego®-from the best places to dine and travel to the style, businesses and people that shape the region. This is the magazine for San Diegans with a need to know. If you download this free app, you will have the opportunity to subscribe to our digital magazine at an annual price of $11.99. You will then be eligible to purchase the print version of our magazine for only $6. This is a combo value deal equal to our regular print subscription price of $18. Order online at: sdmag.us/subscribe and enter the promo code SDMDIGITAL. You may renew at the value rate by calling 619-743-4836. Single issue digital purchases are also available through this app. Enjoy! 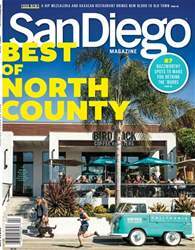 San Diego Magazine gives readers the insider information they need to experience the best of San Diego®-from the best places to dine and travel to the style, businesses and people that shape the region. This is the magazine for San Diegans with a need to know. If you download this free app, you will have the opportunity to subscribe to our digital magazine at an annual price of $11.99. You will then be eligible to purchase the print version of our magazine for only $6. This is a combo value deal equal to our regular print subscription price of $18. Order online at: sdmag.us/subscribe and enter the promo code SDMDIGITAL. You may renew at the value rate by calling 619-743-4836. Single issue digital purchases are also available through this app. Enjoy! You'll receive 12 issues during a 1 year San Diego Magazine magazine subscription. You'll receive 12 issues during a 1 year San Diego Magazine magazine print subscription.